Toyota is among the world’s second-largest automotive manufacturer Company. The company is producing ample of vehicles every year. Toyota Cars are known for providing stylish and powerful cars. Toyota Fortuner is among the premium car with excellent newest features. It is the ultimate luxury car which gives you the ultimate riding experience. Toyota has manufactured cars with best and newest features. Toyota Fortuner provides the mileage of 12.9 kmpl. The engine of the Toyota Fortuner is very much powerful, i.e. 2755cc. It is a 7-seater luxurious car. Moreover, it has manual as well as an automatic transmission type. The wheels of the cars are designed in a perfect way which suits on the overall looks of the car. It has 6-speed gearbox. Toyota Fortuner is the luxurious car which offers ultimate experience of driving. Toyota is the most promising brand of cars. The company tries their best always to meet the exact expectations of the customers. Most of the cars of Toyota contain the latest technology features. Toyota Fortuner offers multi-function steering wheel which helps to make your long journey easier. The system inside the car is a touch screen. There is an also a start-stop button in the car. 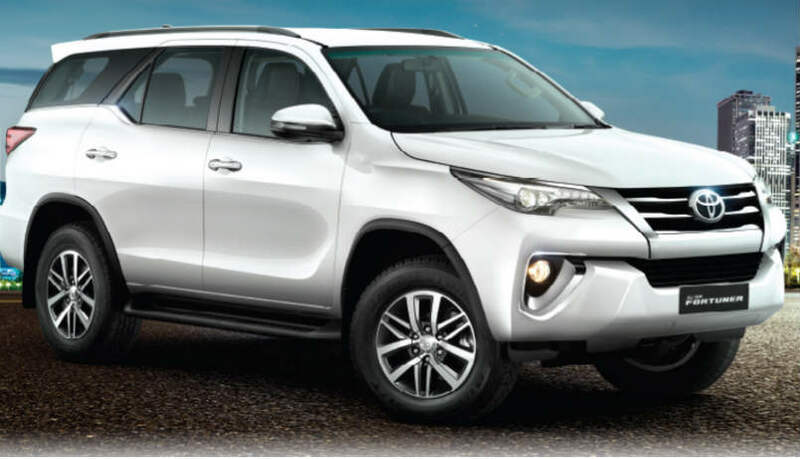 The major feature in the Toyota Fortuner includes Alloy Wheels, Fog Lights – Front, Power Windows Rear, Passenger Airbag, Driver Airbag, Air Conditioner, Automatic Climate Control, and Anti Lock Braking System. The experts of the company have designed the car with great efforts especially of the design of the car. This brand new SUV seems very much attractive and stylish. It attracts the attention of many customers. The body of the car is very strong and unique. The grace of the car is adorable. The tyres of the cars are added according to the look of the car, it also perfectly fits the overall looks of the car. Toyota cars are not only famous for excellent efficiency, but it is also popular for the unique and classy designs. The price of the Toyota cars is completely justifiable if compared with the features and specifications offered by the car. Toyota Fortuner price lies in between the range of the Rs. 27.27 – 32.97 Lakh. It is the car which gives you wonderful experience of driving.